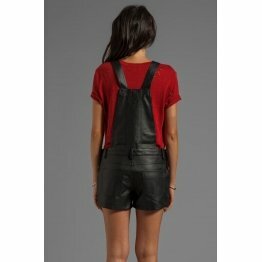 Leather romper women is the most comfortable outerwear for all occasions whether it is casual or formal. They can be used for picnics as well as birthday parties with high heeled shoes. Crafted from different types of fabrics choose one that fits you best. Depending on the fabric you can wear it for a formal or casual occasion. A romper is one piece of woven fabric, leather or any other with a V-neck. It has side pockets on either side and a zip fastening behind. It is 100% polyester and can be washed by machine following the instructions on the care label. 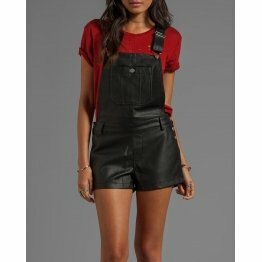 Rompers are ideal for people who want to pull a dressier look. Today you see a lot of celebrities in rompers on TV. The leather romper women can easily go from day to night. During the day you can team your romper with a cardigan and cute wedged shoes. For the evening wear you can drop the cardigan and team it with high heels and sparkling bangles and earnings. You can add a belt to accentuate the waist and give it a formal touch. 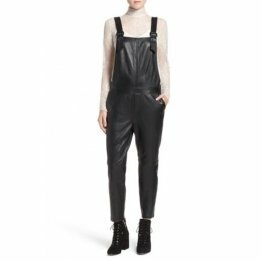 Women’s leather jumpsuits are ideal for the duration of the summer. The women of today prefer jumpsuits to dresses as it is just one piece that you can use to cover yourself. There are jumpsuits of leather and fabrics too. Women who like jumpsuits can get them of lambskin which is soft to touch. The pants have paneled design and side pockets with press buttons. It has adjustable straps with buckles and front zip closure with flap that gives it a stylish look.You can also get cropped leather jumpsuits for women that are fully lined and available in different colors. Denims today is the trend and you can shop online for a variety of jeans ranging from different styles to colors.A woman’s form is accentuated by well- fitting clothes so pants too need to be well fitting. You can choose from a wide array of fits the right fit in leggings, denims and trousers. There are slim fit jeans to skinny fit jeans, choose well-fitting jeans for a stylish look. There is a large variety of formal pants for every lady to have her pick which include regular fit trousers,cotton tapered trousers and pleated trousers for women. There are leopard print trousers and polyester crepe trousers which are ideal for a casual day out.A pair of high- waisted rayon trousers or slim fitting leggings with loose flowing tops is perfect for casual outings. Trousers, palazzos, leggings and denims for women are available in different colors. If you want to make your outing snazzy then choose colored leggings or printed leggings. Zip leggings are also very attractive. Top up your brightly colored jeans or leggings with the right tees and you are stylishly turned out. You can brighten up any day with colors like maroon, green, brown, yellow, red, purple, pink and blue. There is a wide range of romper swimwear in bright colors with high neck and cut out sides with adjustable lace-up back. Wrap romper, lace hem romper, and spaghetti strap romper are some of the outfits for a trip to the beach. If you want to pick up a leather romper women to add to your collection choose one with a belted waist for a perfect look.